When I was young, I used live with my grandmother and saw my mother rarely. Whenever I visited to see my mother, she used to cook for me Cabbage Kimchi (with spicy chillies and vinegar ).Although I didn’t like it at that time, I remember that my mother used to tell me the health benefits of cabbage which included alleviating constipation, skin disorders and most of all reducing excess weight. Cabbage is a inexpensive vegetable but healthy especially when you eat it raw rather than cooked. In one recent study, short-cooked and raw cabbage was the only types of cabbage to show cancer-preventive benefits—long-cooked cabbage failed to demonstrate any measurable benefits. Cabbage and Carrots are my main vegetable staples in my fridge. There are so many way to use these two vegetables and whenever I want to eat spicy vegetables in Cambridge I normally make this cabbage Kimchi. 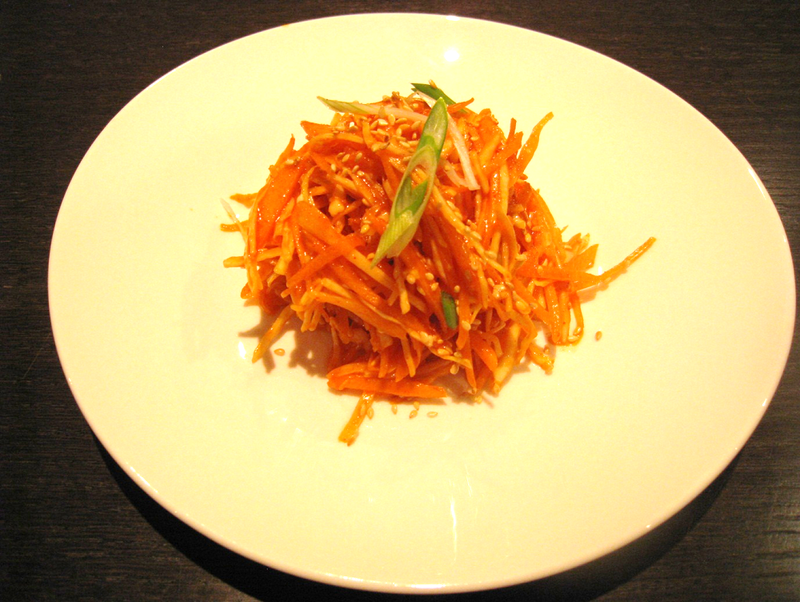 If you want to try to make this dish then you need to go to the Korean supermarket to buy “Gochujang”. This is Korean Chilli Paste and is an essential ingredient to use in many Korean dishes. Slice the cabbage (just soft side of leaves) and carrots.You need to slice them as thinly as possible to give the best taste. Add “Gochjang” (Korean red chilli paste), sesame seeds, sesame oil, lemon juice and honey, grated garlic and pinch of white ground pepper. Here you can see my three servings of Cabbage and Carrot Kimchi with other food ready for a small party.